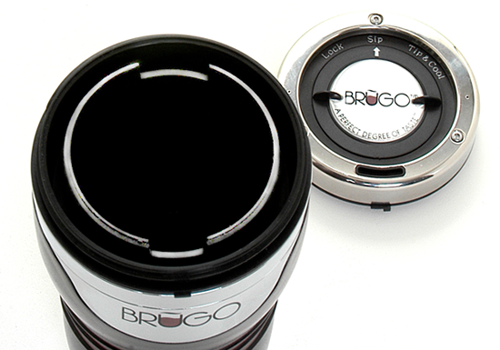 I'm so excited to bring to you today, Brugo, the amazing coffee travel mug! I've had this for a few months and couldn't wait to share it with you during Coffee Month! This is not your ordinary coffee travel mug. This is a Smart Travel Mug! Are you familiar with filling up your coffee in a travel mug, driving for 1/2 hour and dying to drink that coffee but you know it is still at a steamy 190 degrees and you know as soon as you go to take a drink you'll hit a pot hole that hasn't been fixed yet by the Obama "Fix the pot holes" dollars??? Not wanting to burn your lip with a quick sip you just wait and wait until you finally forget it is there and then when you do remember it is coldddd and nasty and you are in the car and you can't nuke it. WASTE! I tell you this because BRUGO has developed a travel mug that allows you to drink immediately, cooling each sip you take and keeping what you aren't sipping hot! It is called Tip and Sip, a patented Temperature Control Chamber! I know this sounds impossible! The mug is also spill proof, 16-oz, double-wall insulation, stainless steel finish, no-slip bottom, ergonomic grip and fits most cup holders! Still sound impossible?? Well it isn't and it is here for you to win! Go check out their Facebook page and tell them Susieqtpies at Scraps of Life sent you! To enter: Go check out BRUGO and come back and tell me something from their site that I didn't mention here. Leave your email address with this entry. DISCLOSURE- BRUGO sent me a mug to review through The Product Review Place. All tasty words and opinions are my own. They will mail a mug to the winner. USA and Canada. Colors vary. Cool! It has a temperature controlled chamber! I love the non skid bottom. I added your button to my blog roll. I follow Brugo Mug on twitter @FrugalFMF. You didn't mention that the guy who invented it has an awesome (Greek?) name! #5 - 1/5 - I definitely want the MIST color! #5 - 2/5 - I definitely want the MIST color! #5 - 3/5 - I definitely want the MIST color! #5 - 4/5 - I definitely want the MIST color! #5 - 5/5 - I definitely want the MIST color! #8 - 1/5 - I entered the Radius toothbrush giveaway! #8 - 2/5 - I entered the Radius toothbrush giveaway! #8 - 3/5 - I entered the Radius toothbrush giveaway! #8 - 4/5 - I entered the Radius toothbrush giveaway! You get Free STANDARD Shipping @brugomug on all purchases of $50 or more. I Follow your blog on Google Friend connect 1/5 entries. I Follow your blog on Google Friend connect 2/5 entries. I Follow your blog on Google Friend connect 3/5 entries. I Follow your blog on Google Friend connect 4/5 entries. I Follow your blog on Google Friend connect 5/5 entries. I Follow your blog on Networked Blogs 1/5 entries. I Follow your blog on Networked Blogs 2/5 entries. I Follow your blog on Networked Blogs 3/5 entries. I Follow your blog on Networked Blogs 4/5 entries. I Follow your blog on Networked Blogs 5/5 entries. I Follow you on Twitter 1/5 entries. I Follow you on Twitter 2/5 entries. I Follow you on Twitter 3/5 entries. I Follow you on Twitter 4/5 entries. I Follow you on Twitter 5/5 entries. I would love to have "Midnight" if I won 1/5 entries. I would love to have "Midnight" if I won 2/5 entries. I would love to have "Midnight" if I won 3/5 entries. I would love to have "Midnight" if I won 4/5 entries. I would love to have "Midnight" if I won 5/5 entries. I comment on the Aug 10 Coffee Month Page 1/10 entries. 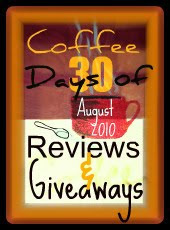 I comment on the Aug 10 Coffee Month Page 2/10 entries. I comment on the Aug 10 Coffee Month Page 3/10 entries. I comment on the Aug 10 Coffee Month Page 4/10 entries. I comment on the Aug 10 Coffee Month Page 5/10 entries. I comment on the Aug 10 Coffee Month Page 6/10 entries. I comment on the Aug 10 Coffee Month Page 7/10 entries. I comment on the Aug 10 Coffee Month Page 8/10 entries. I comment on the Aug 10 Coffee Month Page 9/10 entries. I comment on the Aug 10 Coffee Month Page 10/10 entries. I follow all of these and am dying to win one of these mugs!!!!!!!!!! Preferably the dusk colored one! I like the idea of a non-skid bottom. I can use it on my desk and not worry about it sliding! I'm following @susieqtpies on Twitter! You didn't mention the inventor is a coffee addict! You can get a discount when you buy two! There is an Executive, Jazz and Sports line of mugs!